Certain exhibitions are change-makers: Okwui Enwezor’s 2002 Documenta, Elisabeth Sussman’s 1993 Whitney Biennial, Francesco Bonami’s 2003 Venice Biennale. Others, however enjoyable, have sunk without trace. The years when Venice, Documenta and Skulptur Projekte Münster coincide always raise expectations. This was heightened in 2017 when, thanks to the Whitney Museum’s relocation, its biennial was a year late, so joining the art world’s decennial stocktaking in Europe. Many have noted that these shows were planned before the nationalist triumphs of Brexit and Trump, or the hardening of left-wing politics evident in no-platforming and sculpture-smashing. But artists and curators—notably Documenta’s Polish-born director Adam Szymczyk—were clearly more than aware of the divisive forces sweeping through Europe, through India, Russia and China, and the waves of refugees escaping war and poverty. And, as in politics, art’s fault lines (some might say battle lines) have been drawn. Pretty pictures, like Peter Doig’s Rosedale (1991), sell for tens of millions of dollars, but many artists eschew such anodyne fare. At the Whitney Biennial, the collective Postcommodity were among numerous artists who took political issues head-on, with a huge, four-screen video, A Very Long Line (2016), made as they drove the 3,000km US-Mexican border. In Athens, Maria Eichhorn exemplified Documenta’s methods and tone with Building as Unowned Property, an attempt to legally turn a building into “ownerless” property—a commentary on the political failures that led Greece to financial bankruptcy. Szymczyk positioned Documenta as a critique of neoliberalism. But if the homogenisation of globalisation is out, the idea that good art is made globally is not. From the Tate’s Soul of the Nation, touring to Crystal Bridges in February, to the focus on Latino artists in Pacific Standard Time: LA/LA (until January 2018), artists from around the world—a few working outside the Western tradition, and many outside the art market—are coming to the fore. The curator Christine Macel included the work of an Inuit artist, Kananginak Pootoogook, in Venice, while the Brazilian artist Ernesto Neto collaborated with the Huni Kuin people. Noticeable in both Venice and Documenta were artists who use “domestic” or “craft” materials, foregrounding the labour of women and poor workers, many in the developing world. 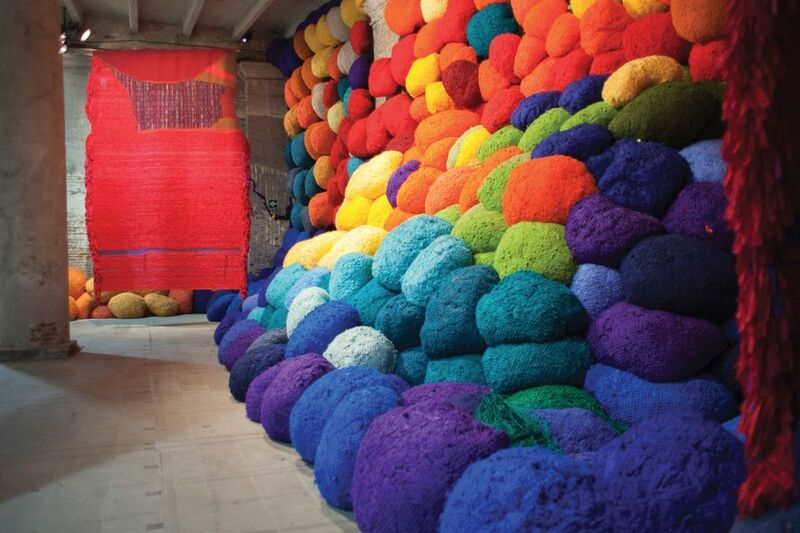 Macel finished a space in the Arsenale with a huge, woolly installation by the US artist Sheila Hicks. Many artists share a love of archives, taxonomies and documentation. But show-stopping works by the likes of Kader Attia (prominent in Documenta 13) are giving way to a harder-core version. In Documenta, there was everything from dance notations by Anna Halprin to Olu Oguibe’s Biafran War pamphlets. “There are so many well-intended progressive statements,” wrote Daniel Birnbaum in Artforum of the show, “that it occasionally feels like a trip to quinquennial perdition”. Digital technology was notably absent in both Venice and Documenta, its atomising effects countered by performances—live and filmed. Szymczyk called it a necessity “in the digital age, when the body is reduced to data, that the physical body is not ignored”. In Münster, Kasper König took a different tack: After ALife Ahead (2017) by Pierre Huyghe mixed installation and digital imagery only viewable on an app, and Hito Steyerl—top of the Art Review Power 100 in November—presented a video game-inspired critique of war in HellYeahWeFuckDie (2017). Works using virtual reality, especially Alejandro Iñárritu’s Carne Y Arena (on show at the Prada Foundation in Milan and the Los Angeles County Museum of Art), continue to attract widespread interest. Given how long it takes to research and mount exhibitions, it is premature to judge the impact of 2017’s grand tour. But it is clear that artists are making determined claims for art’s social value. Many are also turning away from the easily consumable, high-skill, high production values that draw crowds to museums and generate high prices in the market. Is this the art world’s Savonarola moment—a peak of protest before everything returns to normal—or, appropriately on the 500th anniversary of Luther posting his Wittenberg theses, the signs of a more profound reformation?